Studio 54 was the epicenter of 70s hedonism--a place that not only redefined the nightclub, but also came to symbolize and entire era. Its co-owners, Ian Schrager and Steve Rubell, two friends from Brooklyn, seemed to come out of nowhere to suddenly preside over a new kind of New York society. Now, 39 years after the velvet rope was first slung across the club's hallowed threshold, a feature documentary tells the real story behind the greatest club of all time. 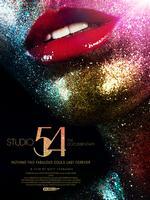 "In 98 minutes, STUDIO 54 captures the club on its best nights and on its worst mornings." "Tyrnauer offers up STUDIO 54 as a memorial to that crazy, licentious time. But the film never has the feel of a dirge - at least not while that soundtrack proceeds at 120 beats per minute." "There's little revealed here that isn't already part of the public record (or gossip columns), though the film does go into the details of the club's precipitous rise and fall. "